On this page, you can find the requirements for participation in the Challenge, as well as resources to help you fulfill these requirements or reduce food waste on your own. Register by filling out an introductory survey that asks you to explain briefly how you plan on meeting the Challenge. Implement or expand a minimum of five of the food saving practices listed below in your business. You may include practices that you used prior to the Challenge, but at least one new practice must be adopted for the Challenge. Twice per year (in January and July), complete a follow-up survey that will be emailed to you. The best way to reduce the impacts associated with food waste is to prevent wasting food - prioritize these practices in your business. The next most important strategy is to donate surplus food to organizations that can direct it to hungry people in need. Finally, after maximizing prevention and donation strategies, direct any remaining food scraps to animal feed, compost, or anaerobic digestion. 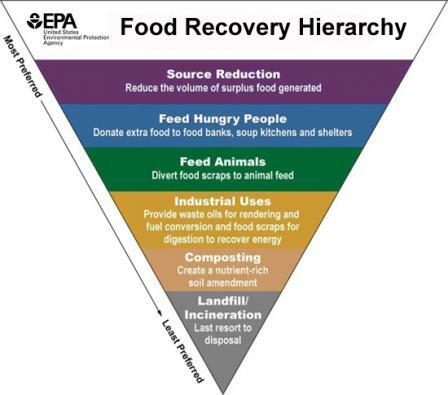 See EPA’s Food Recovery Hierarchy (below) for more information. To participate in the Challenge, commit to implement or expand at least five of the following food-saving practices in your business. The Resources section of this page contains more information and guidance on these practices. Adopt new practices for food purchasing, storage and right-sized cooking quantities to minimize waste; if possible, track any changes in amounts of food purchased. Utilize foods that might otherwise go unused (like imperfect fruits and vegetables and unusual plant parts) and take “nose to tail” approaches with animal products; record any new or modified recipes. Creatively re-purpose surplus foods and record any new or modified recipes. Offer more flexible portions (like smaller portions, half-size options, etc.). Cook in small batches and/or cook to order. Make side dishes and bread optional for your customers. Actively encourage use of appropriately sized “to-go” containers. Educate your consumers by participating in the Save The Food campaign. Engage your staff through training on food waste reduction and food donation, and through recognition for practices that reduce food waste. Enlist at least three other businesses to sign up for the Challenge. See the Resources section for help with donating. Recycle food scraps by composting them (compost on-site, deliver to The Compost Company, or contact a local hauler for pickup services). Keep track of how much you compost or, if you use a hauler, ask them to do so for you. Donate or sell food scraps for animal consumption (for instance, Walden's Puddle Wildlife Rehabilitation and Education Center will accept raw produce, raw meat, and uncooked dairy products, and some area hog farms may accept baked goods and other foods) and keep track of how much and how often you donate. See the Resources section for help with recycling food scraps. The U.S. Environmental Protection Agency has developed a common-sense approach prioritizing best practices in food waste diversion. The best way to reduce the impacts associated with food waste is to prevent wasting food – prioritize these practices in your business. The next most important strategy is to donate surplus food to organizations that can direct it to people in need. Finally, after maximizing prevention and donation strategies, direct any remaining food scraps to animal feed, compost or anaerobic digestion. Visit EPA’s Food Recovery Hierarchy for more information. 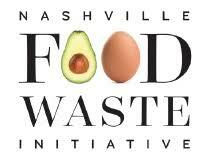 For more information or for assistance, please contact nashvillefoodsaver@gmail.com.